Meejana in Kensington (on the borders of Chelsea, Fulham and Earls Court) is a discretely hidden gem of a Lebanese Restaurant. A relative newcomer on the West London dining scene, Meejana London is the sister restaurant to the original site in Weybridge which opened in 2007 and is famous for its home-made Lebanese food. Meejana has teamed up with Carbon Free Dining, the United Nations-backed Restaurant initiative. At both their Kensington and Weybridge locations, they have chosen to demonstrate their love for the environment by partnering with the programme. 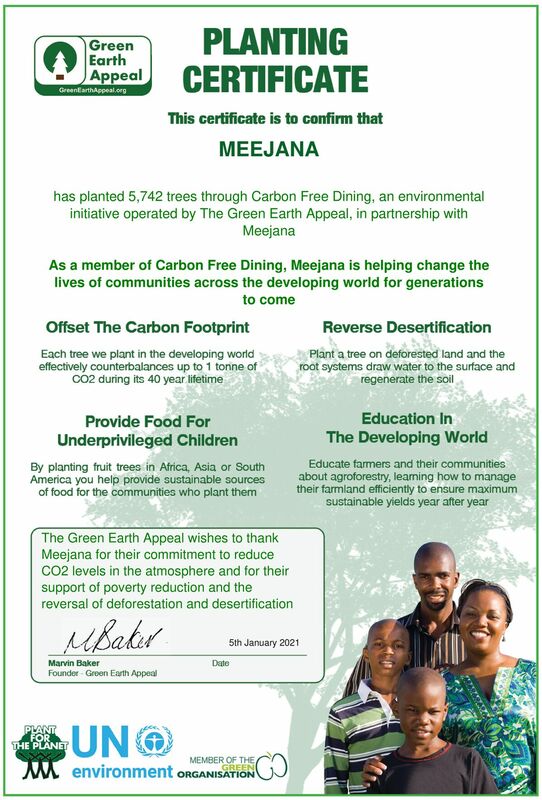 As a Carbon Free Dining Certified restaurant, Meejana plants hundreds of trees each month, effectively offsetting the Carbon Footprint of the meals they serve. This is done by simply giving diners the opportunity of planting a single tree with each bill for an optional 99p.